Figure 1. Data source: National Centers for Environmental Information 2016b. Weather data for 2015 has been posted on the Climate at a Glance data portal operated by the National Centers for Environmental Information (NCEI). Figure 1 shows average temperature data for the contiguous 48 states. Florida, Montana, Oregon, and Washington had the warmest years on record. The Southeast, Northern Plains, and West were much warmer than average. States along a line running from Texas to Maine were warmer than average, but less so than other areas. The number on each state shows what rank, from coolest to warmest, 2015 was for that state. Across the country as a whole, the average temperature for 2015 was 54.40°F, the second warmest year since they began keeping records in 1895. The warmest occurred in 2012: 55.28. In Missouri, the average temperature was 55.8°, the 22nd warmest year since 1885. The warmest was 2012 at 58.6°F. Figure 2. Data source: National Centers for Environmental Information 2016a. Figure 2 shows the national temperature trend since record keeping began in 1895. 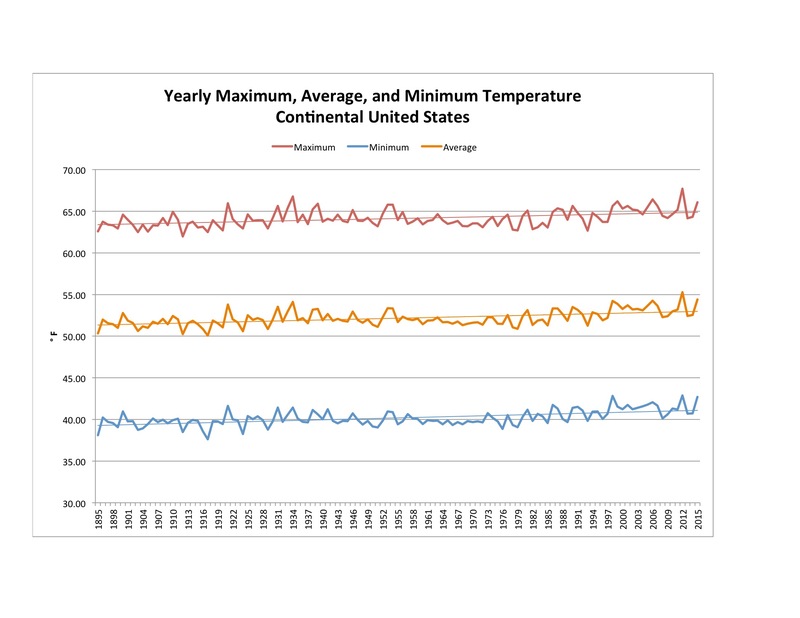 The red line at the top shows the average maximum temperature for each year, the orange line in the middle shows the average average temperature for each year, and the blue line at the bottom shows the average minimum temperature for each year. The thin straight lines show the trends for each. The trend lines slope upwards about 2° since 1895. It isn’t easy to see, but a look at the equation for each trend line shows that the slope of the average minimum temperature is steepest, followed by the slope for the average average temperature, with the slope for the average maximum temperature being smallest. The differences are not large, but it suggests that climate change is causing the average minimum temperature to increase faster than the average maximum temperature. The finding is consistent with projections for climate change: as the temperature warms, the atmosphere can hold more humidity. The humidity reduces the amount of cooling that occurs at night. Figure 3. Data source: National Centers for Environmental Information 2016a. Figure 3 shows the Missouri temperature trend. The red line at the top shows the average maximum temperature, the orange line in the middle shows the average average temperature, and the blue line at the bottom shows the average minimum temperature. The thin straight lines show the trends. 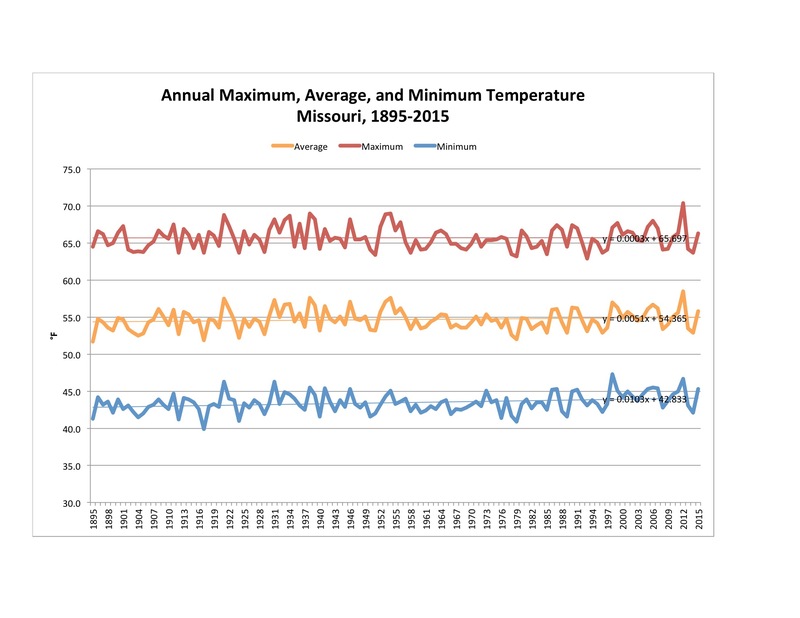 The trend lines show that in Missouri, the average maximum temperature has hardly changed, while the average minimum temperature has increased about 1°F. The change in Missouri is less than the average nationwide change, and the reason is, again, humidity. Missouri is a humid state, and it takes more energy to change the temperature here than it does in a dry state. Because I have been following the water situation in California, I will note that the average temperature there in 2015 was 60.8°F, the second highest since record keeping began. You may have seen news stories about the recent rain and snow in California. It is starting off to be a good water year for them. I’ll look at their water situation in more detail a little later in the winter. To summarize, 2015 was warmer than average across the entire contiguous United States. Along a line of states running from Maine to Texas it was somewhat warmer than average, but less than the rest of the country. In the Southeastern and Northwestern corners of the country, it was the hottest year on record. I’ll look at precipitation during 2015 in the next post. National Centers for Environmental Information. 2016b. National Temperature and Precipitation Maps. Data retrieved 1/9/16. Select Year = 2015, Month = December, and Timescale = 12-Month. By mogreenstats in Climate Change, Weather Patterns on 2016/02/04 .